Figure 28.10. 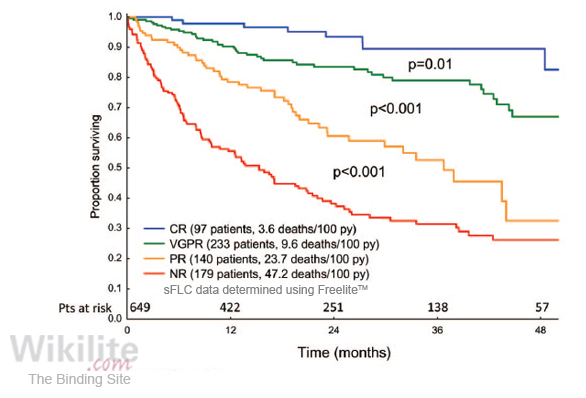 Prognostic value of reductions in sFLCs. (A,B) Kaplan Meier survival analysis of AL amyloidosis patients with a baseline dFLC ≥100 mg/L who survived at least 100 days post SCT. The median OS among those with a ≥90% reduction in dFLC (n=77) was not reached compared with 37.4 months for the remaining patients (n=48), p<0.001. (C,D) Kaplan Meier survival analysis of AL amyloidosis patients with a baseline dFLC >100 mg/L who survived three cycles of therapy with melphalan and dexamethasone. The median OS among those with a ≥50 % decrease in dFLC was not reached compared with 12.2 months for the remaining patients. The median OS among those patients with a ≥90% decrease in dFLC was not reached compared with 15.3 months for the remaining patients. (Reproduced with permission from the American Journal of Hematology  and John Wiley and Sons). Figure 28.11. Prognostic relevance of haematological response assessed 6 months after the initiation of treatment. International case series of 649 patients treated with melphalan and dexamethasone (MDex, 43.6%), stem cell transplant (SCT, 11.4%), immunomodulatory drug-based therapy (IMiD-based, 22%) or bortezomib and dexamethasone (3%). py: patient years. (Republished with permission of American Society of Hematology, from ; permission conveyed through Copyright Clearance Center, Inc.). Kumar et al. studied the prognostic significance of dFLC reductions in 347 patients undergoing an autologous stem cell transplant (SCT). A 50% decrease in dFLC provided poor clinical discriminatory value in predicting survival as 96% of patients in the study achieved this reduction (Figure 28.10A). In contrast, a 90% reduction in dFLC was observed in 38% of patients, providing a more useful clinical separation. 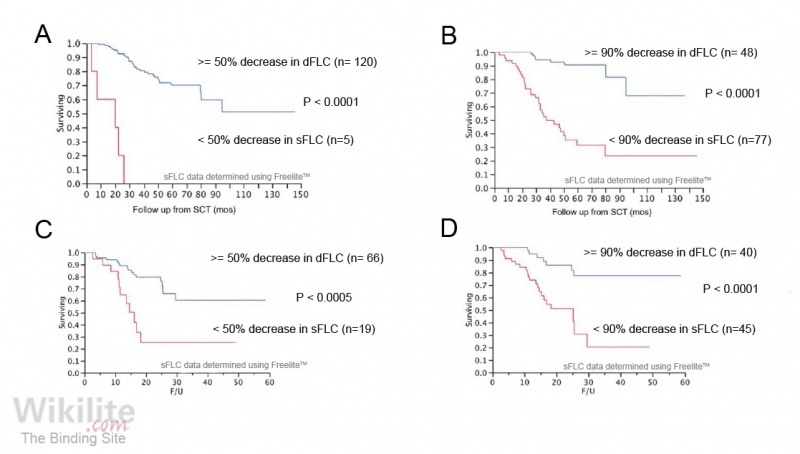 Furthermore, the median overall survival post-SCT, among those patients who achieved a 90% reduction in dFLC, was not reached, compared with the 37.4 months achieved in the remaining patients (p<0.001) (Figure 28.10B). The prognostic value of achieving a 90% reduction in dFLC was confirmed in a separate cohort of 96 patients treated with melphalan and dexamethasone (Figure 28.10C) . The authors concluded that assessment of the dFLC response allows clinicians to modify therapy in those patients failing to achieve a 90% reduction in dFLC. These results are supported by the findings of several other earlier studies . The relative contribution of changes in monoclonal intact immunoglobulin protein and dFLC in predicting overall survival was also analysed by Kumar et al. . Reductions in dFLC were shown to be superior to changes in intact immunoglobulins for predicting overall survival. More recently, in the study used to derive the consensus agreement for response criteria (Section 28.7.2), there was a strong correlation between the haematological response category at 3 or 6 months and overall survival (Figure 28.11). Palladini et al. also found that the depth of haematological response predicted time to second line-therapy. Girnius and colleagues  noted that the studies used to produce the response criteria contained very few patients treated with high-dose melphalan and autologous stem cell transplant (HDM/ASCT). However, Girnius et al. were able to provide data indicating that the criteria did have prognostic value for 140 patients whose response was assessed 1 year after HDM/ASCT. Sidiqi et al. confirmed that AL amyloidosis patients who achieve a CR post-ASCT have a favourable prognosis. Moreover, those patients in CR who demonstrate complete eradication of clonal BMPCs by flow cytometry have an even longer progression-free survival (PFS) than those with residual tumour (151 vs. 72 months, respectively). Manwani et al. confirmed the prognostic value of haematological responses in the subgroup of patients with very advanced (Stage IIIb) cardiac AL amyloidosis. Those patients who achieved a rapid response at day 30 or an overall CR/VGPR at 6 months had a markedly better survival than patients who did not achieve a VGPR. The authors conclude that novel agent-based therapies allow rapid responses and can change outcomes, even for patients with very advanced disease. Sidana et al. evaluated a risk stratification model based on a combination of haematological and organ responses to assess early treatment benefit in AL amyloidosis. Their study included 875 newly diagnosed AL amyloidosis patients, all of whom had heart (76%), kidney (66%) and/or liver (17%) involvement at diagnosis. After 6 months follow-up, patients were evaluated using a combined score based on hematological response and the number of organs showing a response. The score divided patients into two groups with significantly different outcomes (median overall survival not reached vs. 30 months), and had greater prognostic value than haematological or organ response alone. At 12 months, the two groups continued to have significantly different outcomes (p<0.001). As the combined score is easily calculated, Sidana et al. concluded that it can be easily integrated into both clinical trials and everyday clinical practice. Muchtar et al. studied the prognostic value of sFLC measurements in a group of 396 AL amyloidosis patients who achieved a VGPR or CR following first-line therapy. Patients who had a reduction in iFLC ≤20 mg/L or dFLC ≤5 mg/L at the end of therapy had a significantly longer PFS, compared with those whose FLC concentrations did not reach these levels. Only a reduction in iFLC ≤20 mg/L was associated with significantly longer overall survival, and normalisation of the k/l sFLC ratio was not prognostic. The authors conclude that the concentration of iFLC at the end of first line therapy is a useful measure of therapeutic efficacy. Cordes et al. analysed survival data for 74 patients who had received HDM/ASCT and concluded that the lowest post-treatment sFLC concentration provided the best indication of those patients who were more likely to survive for >10 years. Tandon et al. also studied the prognostic value of iFLC concentrations, in a group of 345 AL amyloidosis patients whose κ/λ sFLC ratio had normalised after initial therapy. Patients who had persistent elevation of iFLC concentrations at two time points (n=111) had a significantly shorter overall survival compared to those whose values normalised (78 months vs. not reached, p<0.0001). A multivariate analysis confirmed that the prognostic value of elevated iFLCs was independent of renal function. In the setting of previously treated patients, Palladini and colleagues  identified a number of FLC parameters that define a group at “high-risk dFLC progression”. Their definition requires that three criteria are met: 1) an absolute dFLC >20 mg/L; 2) a dFLC level that is at least 20% of the baseline value and 3) a dFLC that is at least 50% higher than the nadir dFLC achieved post-therapy. The authors demonstrated that almost two-thirds of patients who started rescue therapy met this definition, and these patients had a shorter survival. Using some worked examples, Dispenzieri  found some notable differences between Palladini’s definition with that of the 2005 ISA criteria, but concluded that it is a useful starting point for the amyloid community to develop a consensus of when to reinstate therapy. Palladini et al. compared response to treatment as assessed by Freelite and the Siemens N Latex FLC assays. Although the results produced by both assays were prognostic, percentage reductions in FLC concentration were quite different, leading the authors to conclude that amended response criteria would be needed for the N Latex FLC assays (Chapter 8). Organ responses are typically slow to appear in patients with AL amyloidosis and are usually dependent on an adequate haematological response. The presence of cardiac amyloidosis is the major prognostic determinant in AL amyloidosis. Although cardiac involvement is present in only approximately half of patients at diagnosis (Section 28.1), virtually all AL amyloidosis patients will die from complications resulting from cardiac dysfunction; patient survival depends on the rapid suppression of monoclonal FLC synthesis and stabilisation or recovery of heart function . Measurement of cardiac biomarkers, namely serum cardiac troponin T and N-terminal prohormone of brain natriuretic peptide (NT-proBNP) are useful in defining prognosis at diagnosis (Section 28.4), and should be monitored to assess response to therapy, in parallel with the assessment of haematological response . However, a study by Milani et al. concluded that it was the quality of the haematological response, but not depth of NT-proBNP response, that identified cardiac responders with a significantly longer survival. The important link between improving cardiac function in AL amyloidosis and falling sFLC concentrations was first observed by Palladini and colleagues . Fifty-one AL amyloidosis patients with symptomatic myocardial involvement were given chemotherapy and monitored with sFLCs and NT-proBNP. During treatment, 22 patients had a reduction of sFLCs by more than 50%, including nine patients who had disappearance of monoclonal immunoglobulins as assessed by IFE; a corresponding reduction of NT-proBNP levels was also observed (p<0.001). Survival was superior in responders than in non-responders (p<0.001). This finding was supported by a subsequent study by Kastritis et al. , which confirmed by multivariate analysis that a cardiac response was associated with a haematological response (46% vs. 0% in non-haematological responders; p<0.001). Increases in amyloidogenic sFLCs can precede cardiac progression by several months. In a study by Palladini et al. , cardiac progression was observed in 20/92 patients at relapse, and at this time the median dFLC was half of its baseline value, representing a 4-fold increase from best response . In the majority of cases (15/20), the increase in dFLC preceded increases in NT-proBNP by a median of 6 months (range: 2-8 months). These results indicate that small increases in amyloidogenic FLCs may predict organ progression and should not be underestimated. Further studies have demonstrated a direct cardiotoxic effect of amyloidogenic FLCs , and support the clinical observation that a reduction in circulating monoclonal FLCs translates into a rapid improvement in cardiac function. Therefore, it is important to reduce the concentrations of cardiotoxic FLCs promptly in AL patients with cardiomyopathy.